Students you are almost there! The finish line is in sight! You can make it but you have to keep pushing on. 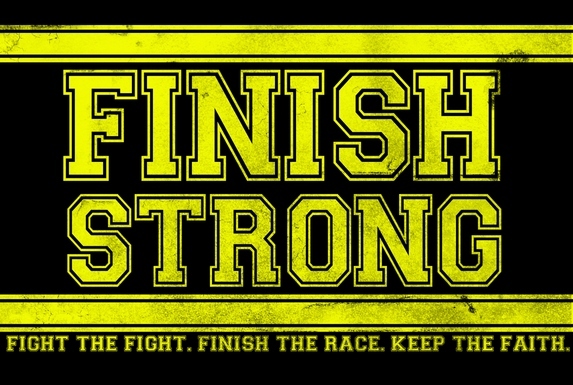 You will finish this school year, but will you finish strong? Some of you are finishing middle school, some high school, and others moving on to the next grade. Don’t quit working hard. Don’t quit studying. Most of all, don’t quit your Christian walk and testimony. The Apostle Paul wrote these words to Timothy as he was anticipating his death and new life in heaven. Paul kept faithful to the Lord and in proclaiming the Gospel through all kinds of hardships and difficult situations. As you finish school for the year, will you be able to look back and say “I finished strong”? Keep up your devotion time in God’s Word. Keep up your testimony in front of your teachers, classmates, friends, and family. Stay plugged in at LightSource. We need you to keep faithful in serving together and in leading by example.